It is increasingly clear that educators’ unions have a new fighting spirit since the uprising of teachers in West Virginia last spring. The school year began with a wave of strike authorizations from LA to Seattle. Many of these votes were quite strong, United Teachers of Los Angeles voted by 98% to authorize a strike. In Seattle, however, the Seattle Education Association (SEA) held a strike authorization vote, but concluded negotiations without actually striking. Across Washington, educators have been fighting for and winning long sought after raises, upwards of 34%! A dozen school districts have struck or are still striking and Seattle came close. 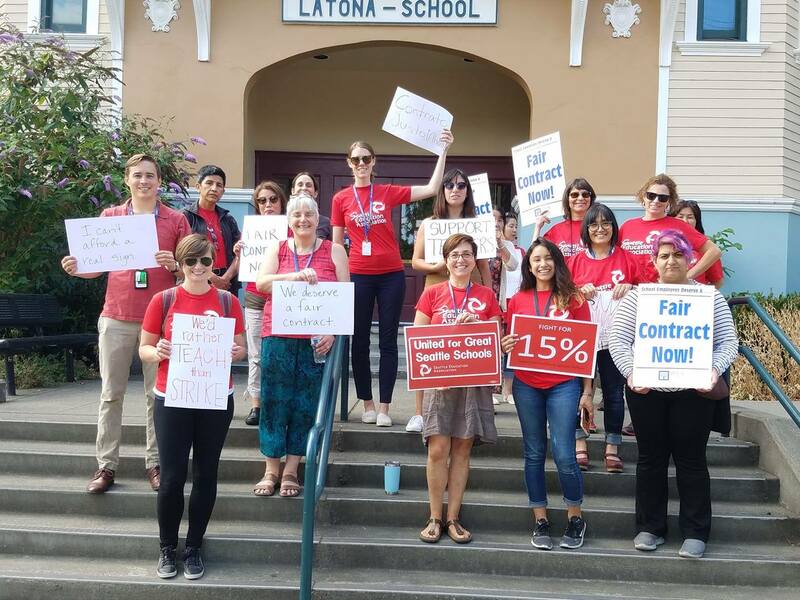 Tacoma struck and won 15% raises for teachers, despite threats of layoffs and legal action from the school district. In Seattle, we won a 10.5% raise over a one year contract, a huge step up from even our previous contract, which won a 9% increase over three years after a week and a half long strike! This indicates a willingness to fight on the part of a strong section of union rank and filers, but ultimately, the leadership must pull out all the stops to build a mass movement of school workers, other unions and the community. In 2015, the SEA struck and won not just a modest raise, but was able to conduct excellent work by using the contract as an arena to struggle for racial justice. On the picket line for over a week and half, we kept the strong support of the community by fighting for equitable access to recess across the district and for educator-led teams at every building to identify and find solutions for institutional inequity. Yet this year, the union leadership and district were both hasty to settle, even after the strength of the strike authorization vote indicated a willingness to fight on the part of rank-and-file educators. The SEA membership would have moved mountains to support our bargaining team, but this burgeoning confidence in our own power was not shared by the leadership. Just days after the strike authorization passed with over 90% support, we had a tentative collective bargaining agreement that touted a 10.5% raise but few other gains related to the demands of smaller bargaining units. Substitutes, led by members of Socialist Alternative, built a campaign for health benefits that gained media coverage and strong rank-and-file support. However, the contract did not include real progress on securing health benefits for substitutes. Counselors demanding student-to-counselor ratios of 250:1, the professional standard, only won a reduction from 400:1 to 375:1. Nurse staffing ratios remain at the abysmal level of 1000:1! Instead of taking the first good offer on the table, we need a fighting strategy that uses the strength of our members, our students, and their families to win, as we saw across the country this past spring. Educators across WA state are now seeing double digit raises more than two years after the state supreme court held the state legislature in contempt in a court ruling in 2012, McCleary v. Washington, as WA state was failing to adequately fund public education. This year, for one year only, Democrats in Olympia dug up an additional $1 billion specifically for teacher compensation, while simultaneously restructuring local property tax levies to more equitably fund rural districts from existing levies in urban areas – not a lasting solution. Despite the state Democrats finding this funding, it was the Democratic Party that was responsible for the majority of cuts to education over the past decade. Since the Great Recession they fully controlled the state government and have prioritized subsidies to Boeing over public schools. Given that the funding from this supplemental budget won’t last past 2019, Seattle Public Schools projects a deficit of over $75 million next year based on the new contract. Even as more rural areas of the state will see marginal funding increases from an increased allocation of state property taxes, which will barely keep up with cost of living, larger urban school districts will almost all be in the red. A permanent solution will require a mass movement of educators and the community powerful enough to close corporate tax loopholes and win progressive funding for our schools at the state level. The Democratic Party has proved that it will take the side of big business and not education, which means that the fight to tax the big corporations and super-rich will require running independent candidates to challenge the corporate Democratic Party. This one year of long overdue funding has raised the expectations of educators in WA, leading to nearly a dozen strikes at the start of this school year, many in rural and suburban areas, including those represented by the Washington Education Association (WEA) in the Tukwila, Evergreen, Washugal, Battle Ground, Longview, Centralia, Tumwater, Stanwood-Camano, and Rainier school districts. In some districts educators were even able to win significant gains without striking – educators in the North River and North Beach School Districts won average raises north of 30%! Next year, however, all of Washington’s districts will need to be prepared to stand united in strike action aimed at state legislature in order to win adequate funding on a permanent basis. Social Equity Educators – a social justice caucus within SEA that Socialist Alternative members participate in – made the correct call to fight for a 15% raise knowing that one way to win permanent funding is to trigger a crisis that can’t be solved with layoffs and cutbacks. In response, the leadership of SEA predicted terrible consequences if we ask for too much. In this doom and gloom scenario, they warned that an unelected emergency manager will come in and cut our contract to ribbons to balance the budget. With the contract we approved, however, the district is already in hole $75 million. Yet somehow if we had won more, like a 15% raise or better staffing ratios, then that would trigger a funding crisis, despite the deficit rising by only one third! As the district threatens layoffs next year, we need to reject this false premise and take up a fighting strategy. As a result of a demoralizing approach by the leadership, participation in the contract vote was low, just a little over one third of the 6,000 SEA members voted in favor. Socialist Alternative supported the call of the Social Equity Educators for a no vote. We can’t take what is acceptable to corporate politicians in Olympia as the starting point, we must start with what we need! Build thousands of affordable housing units for housing unstable families. If districts like Seattle, Tacoma and other large WEA locals take a lead, we can start the process by holding rallies across the state this fall, pointing towards a series of escalating actions in the spring. Next articleTrial of Laquan McDonald’s Killer Sparks Protest – Convict Killer Cops!